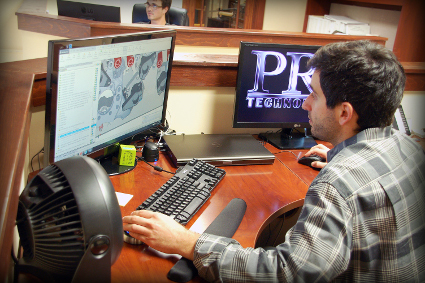 PRZ Technologies, Inc. has earned an excellent reputation in the machine tool industry as one of the most trusted fixture builders in the Northeast. While that reputation began with Walt Przybyl's personal reputation within the industry, and his relationship with our customers, as we have grown, our employees now share the responsibility of maintaining our customers' respect. We hire high-quality people who either bring a solid machining background with them, or if new to the trade, are genuinely interested in becoming tool makers. We expect a great deal of dedication from our people, and in turn, we give them the best working environment we can possibly provide. We maintain a clean, organized facility, we keep our machinery in top running condition, and we have no problem purchasing or upgrading equipment to have the correct tools for any given job. Our pay scale is extremely competitive within the industry. Our full-time employees receive up to six paid holidays and up to two floating holidays each calendar year. They also receive up to one week of personal time, and up to one week of vacation the first year of employment. After the third full year of employment, full-time employees receive two weeks of vacation and after the fifth full year, they receive three weeks of vacation. We provide single health benefit coverage at minimal cost to the employee. Two-adult, adult plus children and family coverages are all available should the employee need it. This additional coverage can be added at the employee's expense. Employees also have access to additional insurances such as disability (AFLAC), in which they may enroll at their own expense. After one full year of employment with PRZ, full-time employees are eligible to set up an IRA with PRZ matching up to three percent of the employee's pre-tax contribution.